The Travis County Republican Party and North Shore Republicans of Lago Vista are co-hosting a Congressional District 25 Candidate Forum and Straw Poll Sunday, September 25th at 3pm. The sponsors of this event are Former Mayor Dianne Costa, Former TX Railroad Commissioner Michael Williams, Retired Lt. Col. and Business Owner Wes Riddle, Citizen Patriot Brian Matthews, and Businessman and Attorney Dave Garrison. There will be live music, light snacks, and beverages. Music will be provided by classical trained pianist Reuel Meditz, who has performed three times at Carnegie Hall. You can purchase individual tickets online for $25 (ages 18 & up) through September 22nd. Student tickets are $10 (ages 13 to 17). Tickets for 12 & unders are free. Tickets will also be available at the door for $35, but there is limited space, so it's recommended to buy tickets ahead of time online. 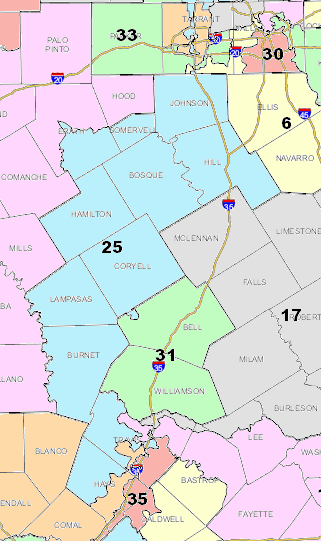 The newly redrawn District 25 encompasses all or portions of 13 counties (Hays, Travis, Burnet, Lampasas, Coryell, Bell, Hamilton, Bosque, Erath, Somervell, Hill, Johnson, and Tarrant).